A project manager approached me recently with a problem. She knew that some of the data that was being submitted in internal reports was – frankly – made up. It was made up with the best intentions from educated guesses and extrapolation. It’s probably fairer and less controversial to say that it was “estimated” rather than created totally randomly from scratch. But she was worried that other people were interpreting the estimate as definite fact. That didn’t sit quite right with her. The PMI Code of Ethics and Professional Conduct defines a set of standards for how project managers should behave. 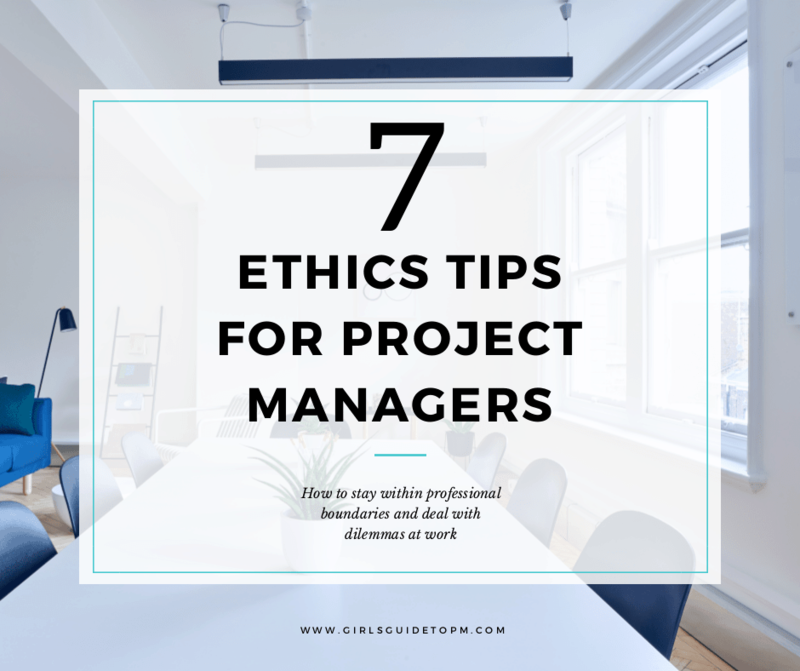 Dealing with these ethical grey areas isn’t an everyday occurrence for most project managers. 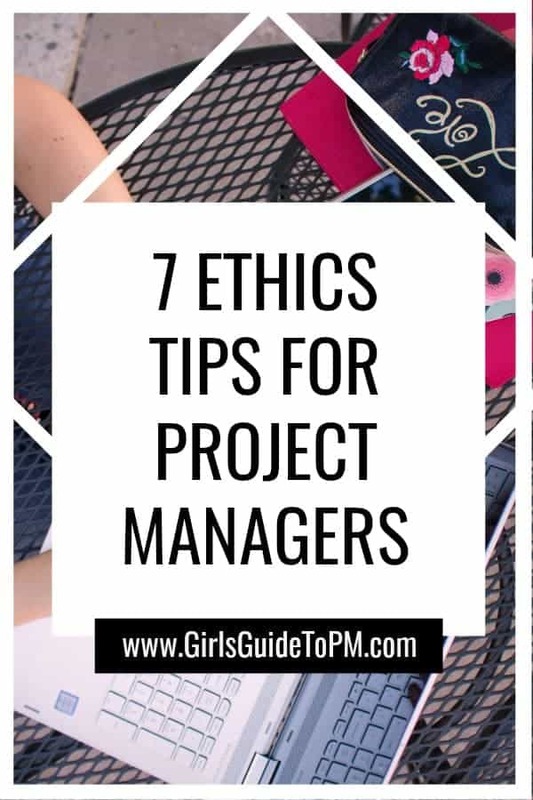 Certain cultures and industries will expose you to more ethical dilemmas than others but generally in our office-based IT landscape the project manager in question (and myself) don’t get asked to take bribes for issuing contracts or anything like that. I’m lucky to get a e-Christmas card from vendors, to be honest. Ethics in project management isn’t a joking matter, and your professional values will be tested on complex projects. 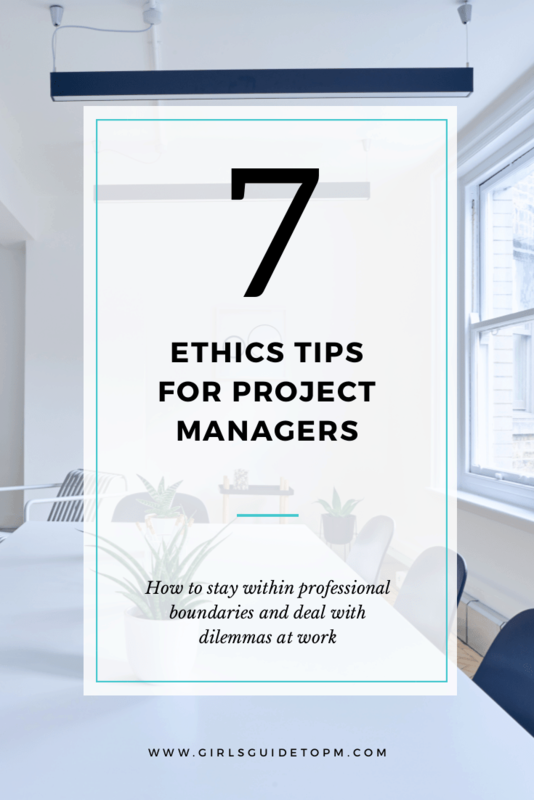 Here are some tips for making sure that you stay within professional boundaries and never put yourself in situations where you feel you could compromise the project, your reputation or your business. So your brother’s company is pitching for work? You know that he’s the best at the job, but you need to remove yourself from the project procurement activity. Tell your sponsor or your PMO manager that you feel there is a conflict of interest. You need to make sure that no one feels he landed the contract because of who he is related to. That will do you both a good turn when he starts work. I am a huge fan in using templates and making the most of what you have so that you don’t reinvent the wheel. But if your old company had a fantastic set of design principles for websites, you can’t get them out and slap your new company’s logo on them and start putting them in front of clients. You can’t unknow what you know, so you can use your interpretation and your knowledge to create a set of design principles allied to the values of your new organisation but informed through all of your professional expertise. It’s quite likely you were hired because of the experience you gained elsewhere. This might seem like a grey line but it’s really not. Don’t reuse assets from your last job. If nothing else, they are probably protected, with proprietary IP and your old contract may have specifically outlined what you can and can’t do with company property. This is lying by omission. You can get round difficult questions by failing to include the one piece of information that wasn’t technically asked for but that might change everything. For example, if you are asked if your project is on schedule, you could reply: “Right now we’re sticking to the plan.” That gives the client the impression that all is well. However, if you know that there is a huge risk coming round the corner that’s probably going to push you off course next month then you’ve deliberately left out information that would give them the complete picture. This isn’t honest or transparent and you are better than that. It’s giving your clients a poor service and doing a disservice to your team as well. Stand up for what you believe in. Don’t be afraid to call people out on their behaviour. You hear someone making offensive remarks: say something. Don’t be bullied and don’t let other people be bullied either. This is where your leadership skills can make a real difference. I know a project manager who quit her jobs because she didn’t want to work on initiatives developing weapons. I know another who left the tobacco industry because it didn’t sit well with their values. Whatever your values are – and even if you can’t quite articulate them you’ll know when you see or are asked to do something that just doesn’t feel right – stand by them. Life is too short to compromise on what is important to you. You should always feel that your sponsor is open to hearing your opinions about the project. You have been trusted with delivering this piece of work on their behalf and they owe you the time to listen to your opinion if you think something is going off piste. Challenge the wrong decision. Talk to your sponsor about why you feel like that. They may well overrule you and go with what they want to do anyway, but you’ll have had your chance to make your point and you may well be able to convince them that an alternative path is better. Never let the fact that someone is in a more senior position than you stop you from speaking up when you have a legitimate dissenting view and can present it articulately and professionally. Read Next: My Life is a PMP® Ethics Question! Author Jeff Furman unpicks an ethics question. I’m sure everyone on your team loves their job so much that they would come in and work on the weekends for free just because they hate being away from the office so much. OK, perhaps there are workplaces like that! But generally you’ll find that there is a limit to your colleagues’ generosity when it comes to putting in extra effort for your project. Asking them to do unpaid overtime isn’t on. If they volunteer for whatever reason, then that’s different. But don’t pressurise them or “encourage” them to do more than they are prepared to do. They have families. Bills to pay. Be respectful of their time and their loyalties. Whisper it: there are people on the team that you’d go out for lunch with and others that you just wouldn’t. Humans are social creatures. We are drawn to making friends, but not everyone finds themselves in the ‘potential friend’ category. Even people we don’t like much have to work for a living. The good news is that you don’t have to like everyone at work. You just have to be able to work with them. That’s a level of professionalism that shouldn’t be beyond you. The bad news is that when your favourites are noticeable that can create problems. Fairness is important. So don’t take a junior direct report out to lunch once a week because you have a lot in common and then ignore the others in the team. If you can’t treat all your staff fairly, don’t create situations where you are treating them differently. Lunches are on rotation, so everyone gets time with you as their manager and mentor. Sticking within your ethical boundaries is not difficult: it should be part of the fabric of who you are and how you work. I was talking to my brother the other day and he was telling me about looking into getting a GIS project management. This was a new type of consulting service that I was not familiar with and wanted to learn more about. A good way to tell if you are talking to a good company is to look into how they treat employees and if they treat everyone as equals or pick favorites. I will let my brother this as he looks.